Marble floor fit-out was important even in ancient times, and today the use of such fit-out material is still in fashion. 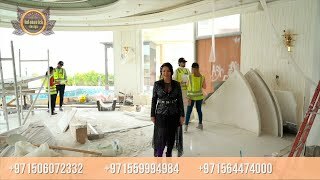 Marble can be called the most favorite fit-out material of designers by Luxury Antonovich Design, therefore facing of floors with marble looks very impressive and elegant, emphasizes the status of the owner, creating a unique atmosphere of luxury and charm in the house. High-quality fit-out of the floor with natural stone gives the interior a special nobility. Traditionally, the device of premium flooring applied natural material — marble. Marble is a material with many natural shades. They depend on the impurity of which minerals are part of the marble. The cost of marble floors, above all, depends on the place of extraction of raw materials and methods of processing. Natural marble for floor fit-out from Luxury Antonovich Design can be processed in several ways. Grinding and polishing are the most popular. — Grined marble absorbs less moisture, because during processing the stone becomes less porous and more dense. — Polishing is the final stage of processing. This stage allows you to achieve maximum smoothness of the stone and give it a glossy shine, contributing to the reflective effect. In order to remove the stone’s slippery nature, Luxury Antonovich Design uses a method such as honing, and crystallization of marble is used to prolong the service life. — large slabs of marble. The floor fit-out is smooth, perfectly flat and solid, without seams and joints, creating a single and harmonious pattern, combining different options for texture and color. — beautiful marble panels, which make up the floors of large halls, banquet halls, exhibition complexes and other cultural institutions. — marble mosaic is beyond recognition. Small marble tiles are laid in various ways and form the unusual pattern, create a whole artistic composition. Marble floors are universal, harmoniously look in all interior styles, perfectly combined with different walls fit-out. Luxury Antonovich Design Company is a regular renewal of the range of natural stone, the manufacture of structures of varying complexity, direct cooperation with foreign manufacturers.